Hard-shell padding and a helmet are essential for more dangerous routes. Taking a mountain bike out around your local trails can be challenging and exhilarating, which is great motivation for pushing yourself toward a better workout. This high-intensity exercise requires you to have a sharp focus, strong muscular athleticism and a great deal of practice. However, once mastered, you can use mountain biking as a fantastic cardiovascular workout for fat burning and muscle building. Before you set out on the trail, ensure that your mountain bike is properly maintained. Check that the tire pressure is at the lower range for your tire's specifications, and check your brakes and derailleurs regularly. Once your bike is ready, gear up with safety equipment. 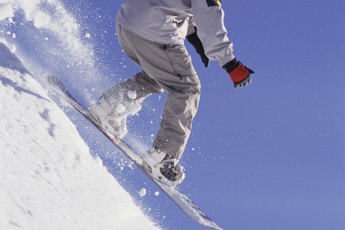 More experienced riders can substitute lighter soft pads for hard-shell pads on the knees and elbows. Finally, use a hydration pack instead of a water bottle to prevent losing your bottle on the trail. For the best fat burning on a mountain bike workout, make sure your body is in a mild caloric deficit. If you burn more calories than you take in on your ride, your body will begin converting stored fat into energy to make up the difference. You can achieve a caloric deficit using websites like Choosemyplate.gov, which allows you to find your specific caloric intake. 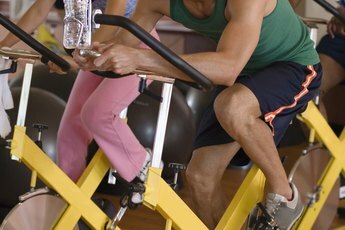 Your body burns calories when you're at rest and when you're working out, so don't skimp on your caloric intake. Choosing a route for your mountain biking workout should depend on your skill and experience. For the best cardio workout and fat burning, choose a route with a dynamic range of elevations. Intervals of high-intensity uphill riding followed by low-intensity downhill sections will push your body above your VO2 max, which is the maximum amount of oxygen your blood can carry to your muscles. When you're above your VO2 max through regular high-intensity exercise, your cardiovascular health will increase over time at a faster rate. This anaerobic exercise also requires your muscles to work harder, which will burn more fat. Since intervals of high-intensity riding have the greatest effect on your cardiovascular health and weight loss, push yourself until you feel fatigued each time you ride your mountain bike. Supplement your workout with plenty of water and an energy bar to keep your muscles moving until you've gone your absolute farthest. Mountain biking is very dangerous and requires a high level of technical skill. Safety measures include telling a friend where you'll be biking, wearing protective padding and a helmet when you ride, and always carrying a cellphone or GPS locator on longer rides. Also, don't tire yourself out far from the trailhead; plan your route to finish where you can easily get home. 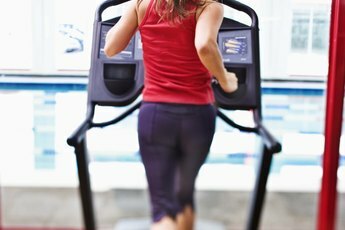 Is Hiking on a Treadmill a Good Alternative for Weight Loss? 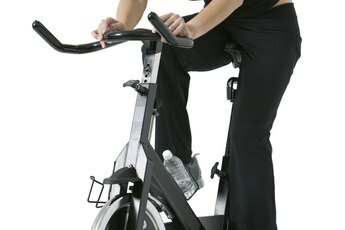 Which Is Better to Reduce Calf Muscles: The Treadmill or Bike?